Don’t ask me how it’s possible. Our little warrior is blowing us away with her strength. Only 24 hrs after brain surgery and she is sitting up. I know it’s hard to believe, but we aren’t actually hoping for recovery right now. Yes, we want her to be healthy and strong, but what we really want is for her to have seizures so the extra special grid laying on her brain right now will capture the precise location of her epicenter and allow them to remove all of the bad stuff without having to remove too much extra. Never got this posted yesterday. Luckily we still have today #purpleday. Reese just had her dressings changed for the first time and they said she did surprisingly well. Better than some teenagers. To me she looks miserable. They don’t know that she isn’t a crier. They don’t realize that all of this stuff touching her head and wrapped on her hands is driving her nuts. I can’t tell you how hard it is to not yell at people for touching her. It’s like when you have to countdown from 20 to not lose your temper at our kids… But so much worse. I can tell she is scared and she won’t let me touch her and it’s agonizing to feel so helpless. Her face is starting to swell so you don’t want pictures now. I want everyone to have this beautiful face in their minds, and not be saddened by what we are seeing. Thank you to all who are wearing purple! You’re wonderful! And when someone comments on that beautiful shirt please tell them it’s for epilepsy awareness. Lots of info on the different potential diagnosis we are working toward. But right now she doesn’t cleanly meet the symptoms of any. So they are all theories right now, that’s all. And now what you know, is what we know. And that isn’t much. Option A: If it’s auto-immune, it’s something in this family of paraneoplastic encephalopathy. Not a picnic, but not impossible, either. Just never seen in a baby is what we gather. An account of a grown up shows how severe it can be. Option B: Rare form of epilepsy – Lennox-Gastaut or Dravet syndrome. Our astute epileptologist pointed out having a name doesn’t really make you feel better if it doesn’t help you solve the problem. But I think for now it’s a start for us. Option C: Her brain needs help breaking down the creatine for a rare condition that she doesn’t make the enzyme or protein to break it down on her own. Could mean supplements and diet changes. If you noticed the trend of all these you get the cookie! Well, maybe I already ate it, but you might have noted no matter what our options are at this point, it’s all rare. I didn’t say it was exciting reading. It’s never been easy for me, that highly coveted virtue — Patience. And it’s particularly hard these days when we feel like we have so much hinging on Reese’s prognosis. A mercurial conversation pending new test results, doctor consultations and her daily progress report. It has been flabbergastingly complex how the inter-workings of her system, the meds, the therapy, the tests, all are co-dependent and yet, we need something to stand out to allow the other pieces to fall into place. Preferably into a logical place, and not just a thousand pieces crashing to the floor. And I think that’s what I fear the most. Bryan and I are planners. We like to dream and we like to build what if scenarios and then build dependencies and plans, to a fault. So right now we are facing literally more scenarios than we can mentally handle and every day it feels like a different one is taking the lead. Why the ramblings? We spent over an hour with our smart, energetic (and most importantly) tenacious epileptologist — a neurologist who only deals with epilepsy. (I love btw that Word doesn’t know how to spell it either). And so here’s the update in the most logical way I can find to explain what our next set of scenarios is. Her multiple weeks on steroids being wired like a junky and equally agitated weren’t for naught. Her brain activity shows a positive response that means her repeat (out of control) seizures would be less likely. And her development definitely took a leap forward. So while we had a normal EEG report as of April 10, we were afraid to share the news, not really understanding the full impact. We HAD an appointment for this coming Wed. with our epileptologist again, but we don’t need it now. Reese is back on steroids. For joy. Doctors think her positive response to the previous steroids means she just didn’t get enough for her brain to fully heal. Seriously. This is the thinking. Sooo, we get to try another high dose, get an EEG again in two weeks (can we get a frequent visitor card? ), and then depending on how much better her brain activity looks will determine how much longer she will be on steroids. At the same time we continue to wait for several tests to come back that they ran while we were in the hospital. The potential scenarios are autoimmune, some rare genetic mutations that haven’t been fully mapped yet, or a metabolic option having to do with breaking down creatine in the brain. 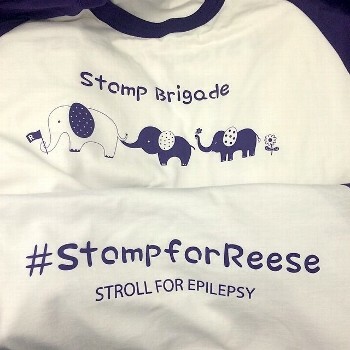 No matter what, the outcome is Reese has something rare. And two of three seem to be fairly treatable. I can’t even recap the whole day but I can tell you about the last 3 hours with a delirious smile, because all we can do at this point is laugh. Bryan’s brother was super kind and satisfied our need to eat something healthy with a big salad and some fruit. But, we got interrupted at least 3 times. First, we were trying to time Reese’s feeding with the nurse’s schedule to give meds, and that meant we had to also get her IV cleaned up so that requires at least an hour of pre-planning because you have to find a tech or an ER person who can handle her tiny veins. But even when that was cleared up there was still no high chair to be found anywhere. Not sure how that is possible in a children’s hospital. So we fed poor Reese in an execsaucer that she was really too tall for. Here she is surrounded by pretty colored toys for the first time in 3 days and we expect her to ignore them to eat! And as if that wasn’t enough, half way through her scarfing down 4 oz of baby food, we smelled either sulfur from a lit match or could have been like plastic melting, I was ready to detach her from all the devices and carry her and saucer out the door. But they decided it was in the ventilation system. Disaster avoided. Reese didn’t nap at all today. The new anti-convulsant is kicking in. So when they were dilly dallying about all these things to get done I warned them once she is asleep I am not letting you near here. So of course, in all the earlier commotion nurse forgot to take Reese’s blood pressure. She came in and basically I think I could see her change her mind. Said she HAD to do it in about 3 hrs. I nodded politely. And last, but not least, the video tech couldnt see R in the crib. Hello!??! We have been in this room for 8 hours and he waits until she is finally asleep to have us move her damn crib around so it is in a better position for the ceiling video camera. Of course the 1950s-style asylum crib wheels squeak and we bump just about everything else in the tiny room trying to adjust the crib about 30 degrees. Seriously. Comedy of errors I tell ya. The purpose of the EMU is monitoring seizures around the clock with both video and EEG. It is a little hard to do when you also are sent to ICU. But thanks to these nifty wifi remote networked cameras on wheels from Sony, Reese still has full EMU coverage two floors down. I even watched the marketing video — IP plus Italian word for beautiful Bella = ipela. I of course let myself imagine what this experience would be like when everything is wireless and we don’t have 10 lines crossing every time she sits up or rolls over.